Over the years the Coliseum has been the home of some of the world’s most talented performers and it proves its muster once again in 2018 as it welcomes a teen heart throb from the 1950s, ready to show younger stars how it’s done! 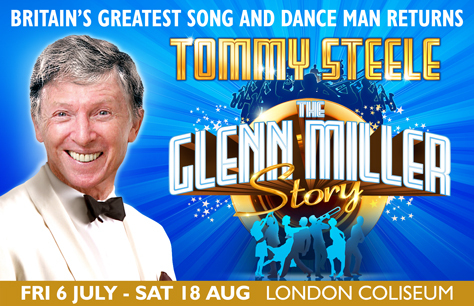 Tommy Steele, continuing to impress many decades after his career first exploded, presents this unmissable celebration of the icon Glenn Miller as he belts out some classic tunes. For fans of Steele – and there are many – and for Glenn Miller aficionados, this will be a must-see when it plays in the West End this summer. Glenn Miller was the famous big band leader whose work popularised some iconic songs that remain staples of the 20th century sound. His recordings of tracks like American Patrol, Chattanooga Choo Choo and Little Brown Jug still inspire and influence and his work with other musicians ensure his legacy will be felt for centuries to come. And Tommy Steele was one of those he influenced with the tracks. Miller had his biggest success in the late 1930s/early 1940s and Steele was not far behind him, emerging in the 1950s to great success and he forever credits him for his career. So for The Glenn Miller Story watch as an English superstar puts his mark on the icon, singing his way through some hits and telling his memorable story. The London Coliseum is a great place to witness this production, having welcomed some big names over the years and staging many musicals alongside its usual array of ballet and operatic shows. 2018 also brings productions like Notre Dame De Paris and On Your Feet, amongst others, and it is sure to bring in many punters before the year is up. The Glenn Miller Story runs at the London Coliseum from Friday 6th July 2018.